I know it’s hard to get excited about Kahn’s Range Rovers, because to be honest they put one out every week. But this one is a rather special one. The 2012 Vesuvius edition Sport 300 will leave a distinct impression which is very special: more superior than that of a Lamborghini or Ferrari because of its special exterior modifications with similar performance to match. The main highlight of the car is the unique color combination. 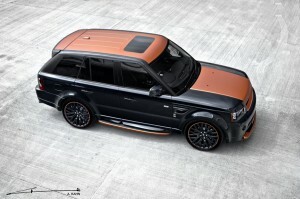 This special edition ultimate Range Rover gets special orange hood and custom orange interior pieces along with suede letting you know visually that this is not your average Range Rover Sport. Indeed, the Kahn body kit and 22-inch RS wheels also play a major part in its excellence.